The trend of growth in eCommerce has seen more companies delivering and selling goods via Amazon Fulfilment Centres, and demand increasing. Amazon allow the supplier an easier and low cost route to reach Amazon UK and EU marketplaces, therefore exposing the suppliers products to larger markets than ever before. We work with several companies to provide their logistics solution for delivering goods into Amazon. Take a look at this infographic for more information about the developments on Amazon and ecommerce. Why choose The NX Group to deliver? We have a wealth of experience in delivering into Amazon Fulfilment Centres, therefore we understand the specific requirements for your deliveries. Let The NX Group deliver into Amazon on your behalf. 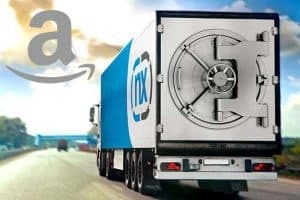 If you would like to find out more about the solutions The NX Group can provide for your deliveries into Amazon, contact the team today on 01604 217855 or email sales@thenxgroup.com to discuss your requirements.